We typically think of hosting our tea gatherings in the morning or afternoon, but sometimes the best fit for our schedule is right after work, in the evening. You can host an effortless evening tea party with these simple but heartful menu and entertainment suggestions. Commit to just an hour or so for an evening tea party. This is a reasonable amount of time to which your guests can agree, and build into any busy schedule. In fact, you can think of this as your power hour — your hour of empowerment and encouragement, with tea and friends. Keep your menu super easy with slow-cooked foods you set up in the morning and serve hot when guests arrive. For example, soup with French bread, chili with corn bread, or even this amazing recipe for slow-cooked Chicken Bruschetta Pizza! When you “set it and forget it” in the morning, you have almost no party prep to do before your guests arrive. On the stovetop, heat up a tablespoon of olive oil in a saucepan. Add the ground turkey and cook until fully browned. Plug in your slow cooker. Combine the cooked turkey with the rest of the ingredients in the slow cooker pot. Stir together, cover with the lid, and then set on low for 8 hours. If you don’t have a slow cooker, make this recipe on the stovetop in a stewpot. Allow 30 minutes or more of simmering for all flavors to combine. 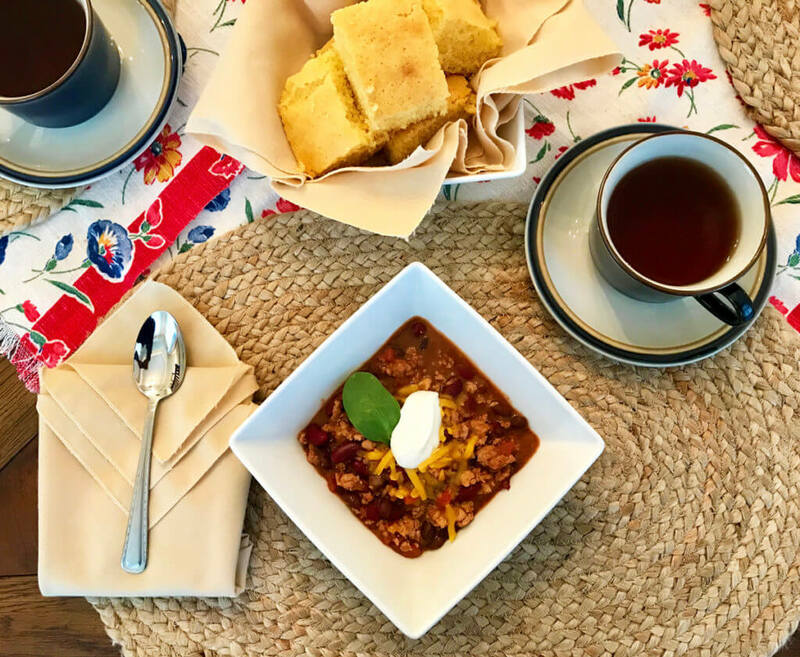 Serve this hearty and warming chili with a side of cornbread and salad, or in a bread bowl. My local market sells small sourdough rounds specifically for soup bread bowls. Pick up a few of these on your way home from work, and pop them in the oven on low while you set the table. Then (carefully) carve out the middle of the bread and pour your chili inside. 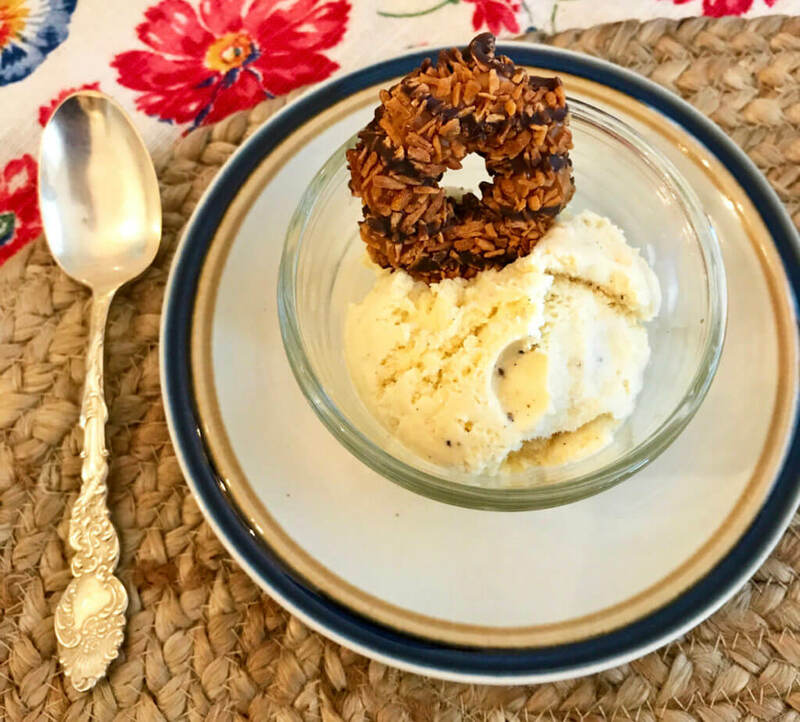 A simple scoop of ice cream makes a perfect end-of-meal treat for your guests. Top with chocolate chips, nuts, whole-fruit jam, or a cookie. Try this unbeatable recipe for homemade Easy Sweet Black Tea Ice Cream. The two-ingredient frozen dessert makes use of condensed milk and heavy whipping cream to create a creamy ice cream mixture. Make this ahead of time as the texture improves greatly after some hours in the freezer. Want to serve an adult tea beverage to help unwind from the day? Check out these five tempting tea cocktails, like Early Grey Gin & Tonic or Urban Chai. Blended, steeped, or mixed, tea can stand up to vodka, gin, rum, or even wine to create a drink with healthful qualities. After a long, hard day it’s good to get in some laughs. Ask your besties to suggest a funny video they saw earlier in the day or week (keep it kind). Use a smart phone or laptop to play the videos while your share your meal. Just a few minutes of hearty laughter provides incredible health benefits such as lowering blood pressure, improving the immune system, reducing stress hormones, and boosting feelings of well-being. Create even more positive vibes by taking turns sharing at least one thing each person was grateful for that day. After your get-together, send out a thank you email to your guests and include the list of things for which they were grateful. 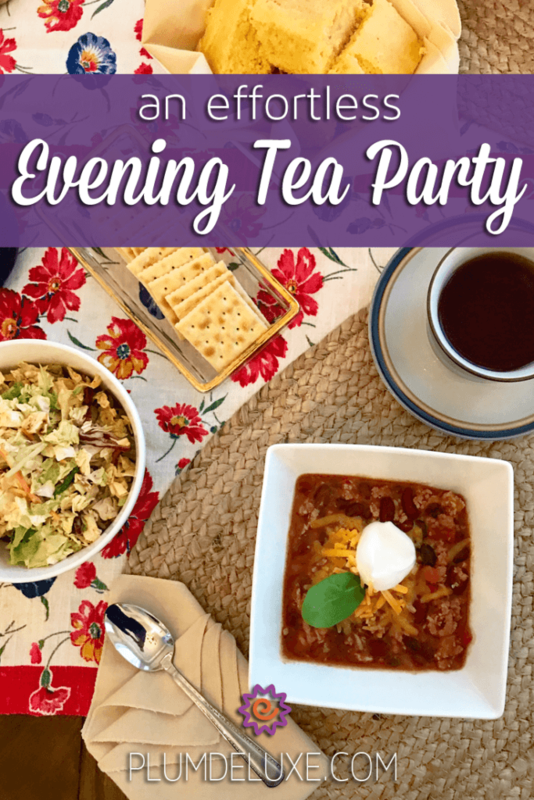 An hour of empowerment can be yours with this effortless evening tea party. 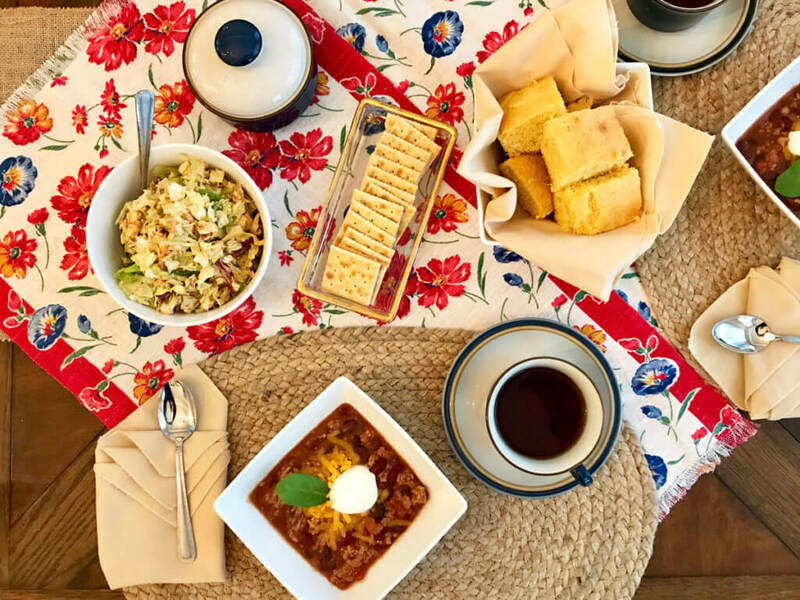 After gathering together for a short time of laughter, encouragement, and an easy-peasy meal, you and your guests will feel recharged and ready to take on the challenges of the next day.